For their debut BIFEM performance, Brisbane ensemble Kupka’s Piano presented a wonderful program exhibiting restraint and intricacy. The program’s evocative themes were particularly brought to life through the septet’s ability to control and balance sounds at such low dynamics. Diana Soh’s Incantare:take 2 (2015) explores the multiple meanings of its Latin title: “to sing”, “to repeat with words”, and “to consecrate with spells”. A restrained sonic palette persists throughout the work: in the first movement the soft woodiness of the marimba and ricochet bowing contrast with fragile syllables spoken into the flute and clarinet. The second movement mixes high string harmonics with breathy flute textures and the third movement lets the gong and glockenspiel punctuate grainy bowing textures and soft winds. The lightness and delicacy of these sounds appeared to float, casting a spell over the entire work. Braneworlds (2016) by Liam Flenady (electric guitar) splits the ensemble into four groups, each group playing to an individual click-track—the composition responding to a Lisa Randall book on multidimensional physics. Repeating gestures within individual groups play with the theme of multidimensionality. The gestures allow the varying tempi of each group to become perceptible within the texture. But Flenady’s control over sparsity, while having so many intricate and individual parts, is a feature. The work often drops away to the paired flutes of Hannah Reardon-Smith and Jodie Rottle, but reincorporates the other ensemble groups at different tempi without letting them overwhelm the overall sonic density. Hearing from the perspective of ‘entering the fray’, I find myself drawn to the orchestration of Elliott Gyger’s new double concerto for two flutes, Fray (2017). Gyger offers a wonderful dialogue between the two flutes, showcasing each possible combination of piccolo, flute, alto flute, and bass flute. There is plenty of mimicking and imitation in the work; not just between the two flutes, but within different configurations of the ensemble, testing whether one entering the fray needs to be different in order to be effective. The most striking aspect of this work is the delicacy and dynamic restraint displayed in the ensemble when neither flute is playing. Whether in the thoughtful harmonic progressions of Alex Raineri’s piano or the regularly sustained phrases of Katherine Philp’s cello, Gyger generates an intricate and quiet sonic landscape which allows any instrument to enter the fray and be impactful, creating friction against the arrangement. The composition’s light ending with two piccolos is fitting for both the piece and the program, highlighting the credit Kupka’s Piano deserve not just for their performance skills, but their programming. 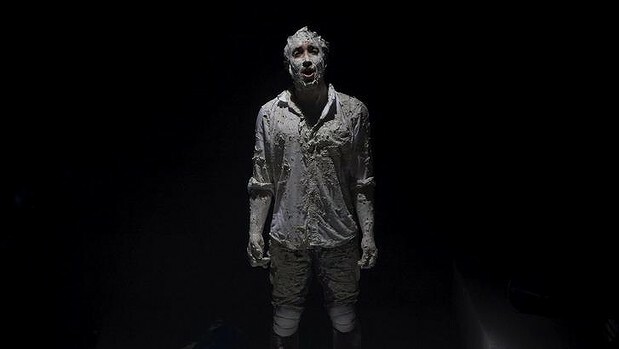 Brenton Spiteri in Fly Away Peter. Photo courtesy of the artist. The surreal style of David Malouf’s novel Fly Away Peter attracted Elliott Gyger when searching for a text for a companion piece to Stravinsky’s The Soldier’s Tale. The Soldier’s Tale is one of Western art music’s great false starts. An colourful ensemble of clarinet, bassoon, cornet, trombone, percussion, violin, and double bass is chain-ganged into the service of a second-rate text. Composed in the wake of the First World War, the folk-tale of a soldier selling his violin to the devil says too little about the events that had just shaken Europe. Writers and composers have since tried to give the work teeth. In 1993 Kurt Vonnegut reworked the text into a tale about the first soldier in the United States military to be executed for desertion. Gyger’s companion piece takes the same ensemble, but provides it with new music, a new text, and even a few new instruments. To Gyger, writing for Resonate Magazine, surrealism is an essential prerequisite for “the wonderful absurdities of the operatic medium.” But surrealism is also an essential strategy for dealing with the incomprehensible carnage of war. Fly Away Peter, produced by Sydney Chamber Opera for the second time as part of the 2015 Melbourne Festival, does not reduce the First World War to a dadaist romp. Instead, like a musical Malouf, Gyger carefully balances clear binaries and their fragmentation. Clancy is torn apart half-way through the novel. The protagonist Jim Saddler rests to take tea after loading supplies for the trenches. Clancy approaches carrying a billy and mugs. Suddenly Jim is covered in blood and Clancy is nowhere to be seen. Clancy had been struck by a “minnie,” one of the German minenwerfer or trench mortars that bombarded the Western Front in the First World War. The traumatic event separates the optimism of Jim’s bird-watching days in Australia from his hardened military career in the trenches. On the surface, the novel is rife with such clear thematic binaries (as a generation of Australian high-school students will tell you): Birds and biplanes, natural and human timescales, life and death. But surreal fragmentation, disorientation, and dismemberment pervade the novel from one end to the other. The novel’s emblem is not the bird, but the minnie. The novel’s fragmented binaries are reflected in Gyger’s music. The score is based on a grid of 21 five-note chords. The pitches of the chords are fixed in register, covering the entire range of the ensemble. Taking his cue from the libretto’s binary of earth and air, each chord is mirrored by another, inversionally-symmetrical chord, resulting in a “landscape-like” grid of pitches. The piece’s pitch profile generally moves from treble to bass as the characters move from halcyon Australia to the battlefield, an aural sensation obvious to all. But instead of simply choosing chords from the lower half of his pitch grid, Gyger reconfigures and layers the grid when Jim reaches the battlefield. The symmetrical binary established at the beginning of the piece is “turned inside out” by Gyger’s musical minnie. One can hear this device as evoking war’s effect on bodies, their dismemberment and distribution over vast areas. It can also be heard as war’s effect on the mind, or more precisely, as evoking the new understanding of human subjectivity to which the War gave rise. The libretto by Pierce Wilcox is set out in three columns, one for each of the principal voices here stunningly performed by Mitchell Riley (baritone) Jessica Aszodi (mezzo-soprano), and Brenton Spiteri (tenor). In this way Wilcox reflects the fragmented subjectivity of the novel’s central trio. Each character is gifted their own distinct faculty of knowing the world around them. The landowner Ashley Crowther is a musician who reverts to tuneless singing when at a loss for words, Imogen Harcourt the nature photographer captures the world in images, while Jim has a unique gift for the names of birds. Like the three wise monkeys of Japanese mythology, they are the three innocent monkeys who have not yet heard, seen, or spoken evil. Only the omniscient narrative voice has access to all three faculties of hearing, seeing, and naming. The distributed subjectivity of the trio prefigures Jim’s psychoanalytic observation, made while drenched in Clancy’s blood—though in the detached voice of the narrator—: “The body’s wholeness, it seemed to him, was an image a man carried in his head.” Fly Away Peter shows how the trauma of war reveals the imperfect and multifaceted knowledge we have of ourselves and our environments. The surrealism of Fly Away Peter is therefore found at the meeting point of intense sensation and detachment. The story is the perfect match for Gyger’s detailed and transparent compositional style. The opera opens with gorgeous birdsong transcribed for the violin of James Wannan. Moments later Jim is taken on a terrifying ride in a biplane painted with little more than a gentle drum roll. At times I found myself gliding along these surface-level depictions. But if one pays more attention to the music, Gyger’s rich harmonic landscape flies by in full colour. The beautiful staging by Elizabeth Gadsby is also both schematic and affecting. Dozens of blue buckets of clay are the opera’s only props. Their varied placement around the five-tiered white stage is an art installation in itself. They begin in asymmetrical patterns, but finish ranged in rows like tombstones. 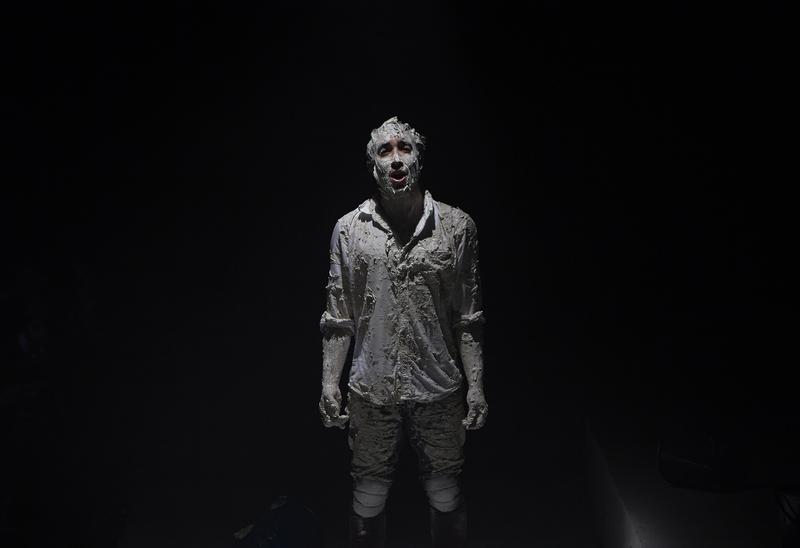 This minimalist staging evokes suffocating terror as the singers cover themselves in the clay. The whole experience flits past so quickly that I feel the work will reward multiple viewings and stagings. Riley, Aszodi, and Spiteri seamlessly and effectively switch between characters and scenes in the retaking of a violin bow. Ultimately the strength of these performers hold together a challenging new work. Mitchell Riley, Brenton Spiteri and Jessica Aszodi. Fly Away Peter, Sydney Chamber Orchestra, Carriageworks, 2015. Photo by Zan Wimberley. Elliott Gyger’s masterful opera, given a polished and committed première performance by Sydney Chamber Opera this week, is surely one of the major musical events of the year. It takes on even greater significance in the context of the ever-more conservative, fearful programming of the major musical institutions in Australia such as Opera Australia. This is not the place to rehash the recent public debates about the value or nature of contemporary opera but it is necessary to acknowledge that Gyger’s work serves as a perfect rebuttal of the foolish arguments put forward by those who think opera should be no more modern than Puccini, or no more radical than a Broadway musical. One can only hope that the prime-movers of such regressive notions have the courage to attend Fly Away Peter. If they did, they might well learn something from the experience. During the past few days, we have seen the opera gain an exceptional degree of critical attention and acclaim in the mainstream media, reflecting not only the inherent qualities of the work and of the performance, but also the sense that the full-house audiences were in the presence of something powerful, significant, and above all beautiful. Contemporary opera is alive and successful in Australia, but it’s not in the Opera House. Perhaps that is a good thing. Poetic, provocative, beautiful, and haunting, Fly Away Peter is work that surely must have a strong future. There have already been calls for this production to tour, and I have no doubt that other companies will be keen to stage it in future years. Cashing in on the ANZAC centenary juggernaut, the publicity for Fly Away Peter gave the impression of this being a war-themed opera. I must admit to some initial scepticism about the work for this very reason and if one did take the marketing hooks as the basis for interpretation it would be deeply problematic. Viewed as a simple war opera, it would be hard to justify such a poetic treatment, which flies dangerously close to romanticising death and destruction. As Adorno famously wrote in 1951, »nach Auschwitz ein Gedicht zu schreiben, ist barbarisch«, and surely one could argue much the same for the appallingly stupid horrors of WW1—and yet we keep at it. Fortunately, Fly Away Peter is not really a war opera, and perhaps only tangentially concerned with the war at all—in this way arguably similar to Malouf’s original book. To my relief, I found that the opera soars above and beyond the limitation of war-commemoration and is much concerned with larger issues of genuine human concerns about the nature of our meaningfulness in the world. In this sense, it is a work of incisive contemporary relevance and not at all a historical drama. David Malouf’s novella Fly Away Peter (1982) is justly renowned for the lyrical poeticism of its descriptive writing. Malouf sings his landscapes and characters lovingly to life with words that convey much more than is written, opening spaces for imagination and wonder. Dramatically, it presented some challenges to the librettist, in so far as there is not a great deal of direct dialogue and indeed not a great deal of plot—some of the key ‘action’ takes place off set, or off the page, and what remains serves more as material for contemplation than drama. Pierce Wilcox has done a very artful job of creating the libretto for the opera, and his text serves as the structuring vehicle for both Gyger’s music and the dreamlike world of Imara Savage’s staging. 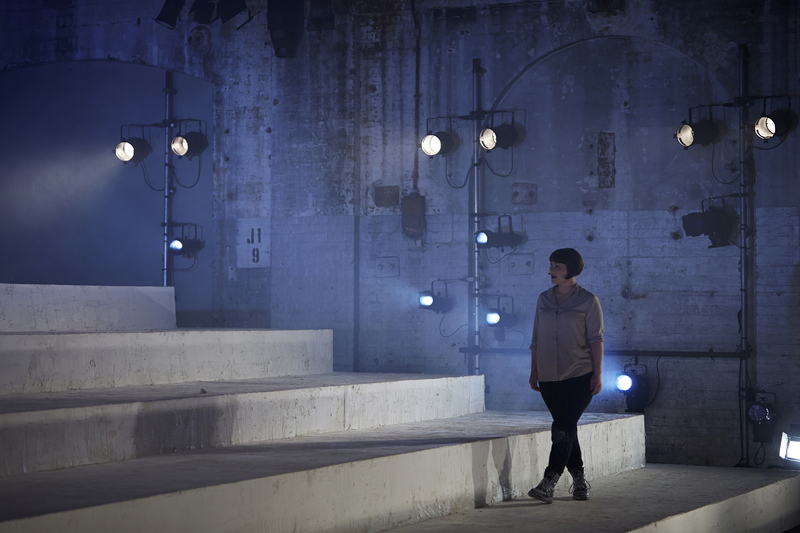 The cavernous industrial space of the Carriageworks theatre works very well for the set designed by Elizabeth Gadsby—an assymetrical pyramid of giant steps washed over with white clay. This set, like many aspects of the work, is only simple at first glance. As the piece unfolds we find that the production is elegantly minimalist, with a well thought-out function and poetry that goes far beyond the merely minimal. The only props are simple blue buckets, laid out across the steps in different ways at different times, and containing the white clay that gradually ends up smeared over characters clothes and bodies. There is a nuanced ambiguity in this, as one wonders whether the humans are growing out of the mud, or dissolving into it. Brenton Spiteri. Fly Away Peter, Sydney Chamber Orchestra, Carriageworks, 2015. Photo by Zan Wimberley. 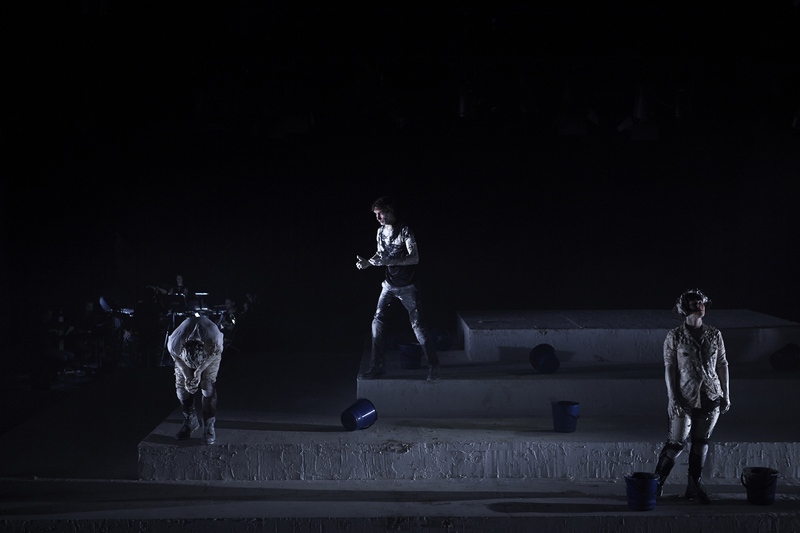 I particularly enjoyed Verity Hampson’s lighting of this production, which uses angled side-lights to play with the singers’ shadows on the huge expanses of concrete wall at Carriageworks. This contributed strongly to the dreamlike, poetic nature of the work as one’s eye was drawn back and forth between the bodies of the singers on the set and their giant, puppet-like figures moving across the walls. As the opera progressed, this created a magical sense of a multi-layered drama in which certain aspects are played out on the ground and embodied, while others are metaphysically projected into other realms of being or consciousness. The singing cast of Mitchell Riley, Brenton Spiteri and Jessica Aszodi have a considerable burden to carry as the only characters on stage for the 80-minute uninterrupted play. The success of this present production is certainly due in large part not just to their individual abilities but their strength as a remarkably unified ensemble. Their actual characters are not fixed, as they fluidly shift from their main parts to speak for others at different times, and to sometimes voice more abstractedly reflective or poetic words—and even birdsongs. It is clear that Gyger composed for these particular voices, making careful use of their individual abilities and strengths. Spiteri has a beautiful, effortless tenor voice that is wonderfully consistent in tone across its range and brings a refined lyricism to his main character of the wealthy landowner Ashley Crowther. Riley’s voice is in some ways more complex, with gear-shifts that complement the youthful athleticism and foal-like awkwardness of his character Jim Saddler, a working man and passionate bird-fancier. In the final, transfigurative scene of the opera, Gyger makes a sensational use of Riley’s powerful falsetto. Jessica Aszodi’s part as the middle-aged photographer Imogen Harcourt is also judiciously composed to use her distinctive and always well-controlled voice to great effect. She has a challenging role to play in some respects, as her character is sometimes part of the main action, sometimes drifting to one side as a kind of chorus, and at other times chatting with the two soldiers (Jim and Ashley) far away on the Western Front, as all three meet in world of the mind that is the centre of gravity of the opera. Her strong lower register proves useful, as her vocal line at times sits within the same space as the male voices; on a musical level as well as a dramatic one she can move in and out of the men’s world. Supporting and embracing the theatrical core of the vocal parts, the instrumental ensemble directed by Jack Symonds is very strong and colourful. There is terrific playing from all seven members of the group (violin, double bass, clarinet, bassoon, trumpet, trombone, percussion), while violinist James Wannan and percussionist Alison Pratt both play key roles with flair and sensitivity. Gyger’s music is always skilful, cleverly designed, poetic and elegant. All these characteristics serve to bring out the subtleties of Fly Away Peter’s libretto and, perhaps more importantly, provide the background energy and structure that carries the play forward with a compelling momentum. The overall musical cohesion of the piece is a tremendous feat—it successfully feels like one great sweep of music and theatre rather than a succession of set-pieces and scenes. This is achieved partly by the use of a carefully planned set of harmonic structures, in which chords and (by extrapolation) melodic lines relate to each other by vertical symmetry—an analogue for the air and earth relations that are fundamental to the text. These particular harmonies, and the way in which they are used for much of the work, enable the creation of music that has a lovely, radiant transparency. This is the source, I feel, of the beautiful dreamlike character of the opera overall, that is sympathetically translated to set, staging and lighting by the production team. At the point of the play where the two young men are translated to the war-zone, the chord materials are re-organised to be more dense, with the harmonic shift being heralded by a skilfully phrased drum solo that grows out of the sound of an aircraft engine. Later sections of the opera seem to move between these two sound-worlds, of the radiantly spacious on one hand and the more claustrophobic, entrapped on the other. Although the instrumental septet is a conscious replica of Stravinsky’s Soldier’s Tale ensemble (1918), there is little other reference to Stravinsky’s work—except perhaps obliquely in the magnificent jazz-age rhythms that drive the aircraft/war section of the opera. Gyger uses the small ensemble in such a colourful way that one cannot help thinking that the large orchestras of conventional symphonically-oriented opera are a little redundant. From the intimacy of brief solos to the massed sound of the full ensemble, a universe of sound is encompassed. The use of muted brass and bowed percussion add another layer of affective colours. With the ornithological focus of the story, it was inevitable that the composer must consider the use of birdsong in the music. Gyger has made skilful use of transcribed birdsongs in some sections of the opera—more in the manner of Messiaen than of Sculthorpe, in so far as the songs are not simple effects but integrated with the musical materials in interesting and powerful ways, moving across registers and woven through the harmonies. In a very interesting recent article, Gyger has noted that this use of birdsong has introduced two new kinds of material to his work: glissandos, and microtones. This is, I feel, very significant. At the age of 46, Gyger has given us his first opera—and at the same time the project has changed his music. To some extent this illustrates how important it can be for composers to have opportunities such as this, to collaborate with writers and dramatists, and in the process to inspire us also to reinvent our worlds. Opera is an inherently strange artistic medium—it is by nature contrived, an extremity of artifice. How could this possibly be made relevant to us as Australians in the 21st century? In this, one senses the significance of the broader achievement of Fly Away Peter: Gygyer has demonstrated that it is possible to write theatrical vocal music that is singable without being simple, that is expressive without being cheesy or melodramatic, that invites us to suspend disbelief and enter the world of imagination that is opera itself. Rather than being stuffy and elitist, this is a universe where each of us hears to some extent our own voices, and where we observe ourselves acting out the drama of human existence. How, the character of Jim asks, can we as fragile individuals stand against such a leviathan as war? He has a vision of a future in which people are herded into cattle-trucks… and he is not only speaking of the holocaust but warning us of our own loss of freedom, of the ways in which we too are herded. The things Jim understands, his natural abilities, seem worthless in this world. Fly Away Peter is an opera about ordinary people being caught up in the great meat-grinder of history. It is about powerlessness. It reminds us that the things we love and understand (symbolised by birds and seedling plants) have no value in the economy of politics and war (wars, after all, are not started by armies but by politicians). Similarly, human life and the natural environment we inhabit seem to have all value leached away, dissolved into the barren mud. And yet, after the tide of inhuman ‘great event’ has turned, these simple, individual activities and delights revive. The war recedes into the form of a near-meaningless nightmare, while ghosts dreaming of birds on the estuary at home in Queensland become ever more meaningful and real. To some extent, Fly Away Peter strikes me as a manifesto of very current relevance: to what sinister machineries of state/nation/ideology/economy are we (unwittingly) serving as the cannon-fodder? To what limited extent is there scope for resistance? What are the dreams and loves that we would cling to, that bring beauty and meaningfulness to our brief lives, and form our only true legacy? In their second concert, BIFEM’s house band turn their attention to two local heroes, Elliott Gyger and James Rushford. They are joined by Clara Maïda, one of the festival’s international guests, in a musical exploration of form and the formless, of ambivalence and flux. In Crystallise, Gyger seeks to compose a polyphony of four percussion voices. Percussionists are usually treated as so many arms activating so many instruments. Gyger characterises each of the four percussion batteries with a particular family of instruments, namely cymbals, wood percussion, metal percussion and tuned percussion. Unable to resist his combinatory urges, each battery also has something in common with another battery, such as the appearance of keyboard percussion in several sets of instruments. Gyger chose the formal structure of a primordial soup coalescing into distinct forms. This is a favourite programmatic conceit of Gyger’s generation, raised as it was on science fiction and pop-cosmology. It would be interesting to study the different mechanisms by which figures emerge from these compositional soups. Do figures articulate, sublimate or emerge out of the morass? I think that this form, by now a terrible cliché, belies a deeper ideology of the compositional process (not that there is anything inherently wrong with having an ideology of composition—we are all shouldered with a few regardless). This is the ideology that there are more or less structured elements of a composition, an ideology that stretches back at least as far as Nietzsche accusing Wagner of “agitating the swamp.” I prefer to think that a composition, be it aleatoric, serial or tonal, is always-already structured, if not by the composer then by the listener or at a “neutral” level. One might say that the structure of a piece (or a once-off performance) is “overdetermined” by so many forms of timbral, pitch and rhythmic listening that a primordial soup is technically impossible to compose. That said, how does Gyger’s soup work programmatically? The piece sounds the same density throughout, giving the impression that Gyger’s is a petri-dish culture where nothing enters and nothing escapes. Elements move about until the four percussive voices take form. This presents a challenge for the performers, who are tasked with differentiating a homogenous texture. Rushford’s Espalier is what I like to call one of his Twin Peaks pieces. This epithet comes from the quality of the synthesizer forming the background of the piece as well as its unsettling atmosphere. In a humorous exchange with ABC Classic FM’s Julian Day, Rushford associated the piece, perhaps more appropriately, with Brian Eno. The piece is inspired by espaliering fruit trees, a process replicated in the exchange of musical material between the clarinet, glass bottles, bass flute, violin and cello, as well as in the physical movement of the performers around the space. Rushford’s second piece in the programme could hardly have contrasted more with the first. Viper Gloss is a concentrated, brilliant explosion of tone colour. It takes as its inspiration the space around a viper: its sheen, the movement of air and the movement of its prey. Impossibly agile and fluid cello and flute lines intertwine above cascades of shimmering piano and glockenspiel notes. With a hiss of aluminium foil in cello strings, the viper strikes and a moment of stunned, muted tones ensues. The peace does not last long, though, as terrifying screaming noises erupt from the piccolo. Clara Maïda’s triptych Psyche cité/transversales returns to the theme of flux and crystallisation with a philosophical and psychoanalytic lens. As Maïda’s notes for the piece tell us, the first movement takes Spinoza’s “fluctuatio animi” as a starting point. Spinoza used the term to denote the ambivalent feelings that arise when one is confronted with an object that has both positive and negative connotations. Musicians will be familiar with this experience from the moment they lay eyes on their instrument each morning; the rest of us have our parents. Maïda’s “fluctuatio (in)animi” is thus the moment preceding this affective oscillation. Both states are presented simultaneously, overlapping and intertwining in an arborescent structure that is yet to be actualised. Maïda faces the same problem as Gyger: that of the presentation of the prestructured. Maïda’s complex of forces once again places the audience in the presence of an already-actualised, “programmatic” flux. The episodic alternation of electronic and instrumental parts also presents the audience with a very clear sense of ambivalent contrast that threatens to override the contrasting processes erring through the textures. For a truly sustained flux of simultaneous forces the audience had to wait a few more hours for the interminable polyphony of Stockhausen’s Sirius. The second movement, “Ipso facto” [“by the fact itself”] does quite the opposite. Whereas “fluctuatio (in)animi” pitts various forces against one another, “Ipso facto” seeks to produce an electronic atmosphere completely devoid of automatism. The electronics of Psyche cité/transversales are a breath of fresh air in a country where the dominant electroacoustic aesthetic vacillates between the concentrated, material exploration of one particular instrument and noise. Rarely do we hear the Ircam house style of glittering, awesome atmospheres generated out of field recordings (though, as prodigious travelers, many Australians get rather sick of them overseas!). The third movement, “Via rupta,” is named after the Roman practice of building straight highways by breaking through obstacles. The obstacles here are psychological, physiological and urban. Field recordings from subways are combined with instrumental parts where the performers play through their strings with plectrums. Moments of fluidity are released as the strings break into loose glissandi. The clarinet sounds like a jackhammer (though I usually associate that sound with dinosaurs, a spot of semantic fluctuatio). You can listen back to the concert at ABC Classic FM.